Of these filters, the ones I recommend as "must haves" are UV (primarily as lens protection) and Polarizing filters. This post discusses the dramatic impact a polarizing filter can have on your photography with very little effort. 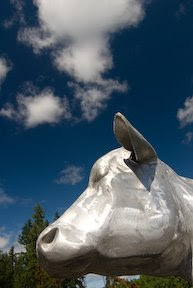 My metal cow picture helps illustrate the effect of a polarizing filter. This image contains two photographic elements that polarizing filters are designed to enhance. 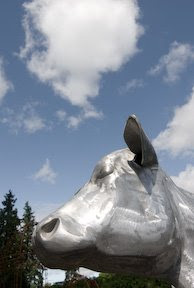 Glare from a highly reflective surface (the cow) and the glare in the sky provided by the naturally occurring water droplets in the atmosphere. Both are shiny surfaces producing light reflections that are all traveling at the same wave length. We perceive this phenomenon as glare. Using a polarizing filter is easy because the effect is seen through your viewfinder. No guessing. No special calculations. A circular photographic polarizing filter for your camera screws into the front threads on your lens. Unlike other filters, after the polarizing filter is installed it can be freely rotated to create the desired effect. In one position the filter has little or no effect, while turning the filter 90 degrees provides the maximum effect (rotating the filter aligns the filter 90 degrees to the wavelength of the glare light and causes the filter to absorb the glare's wave length). Because the filter rotates, the effect is continuous. What I mean is that you can turn the filter to the position that visually enhances your image to the degree YOU think is best. Photographers aren't quite so lucky. Since filter manufacturers know that you might shoot a picture in virtually any position - literally, the filter must be allowed to rotate to the best glare reducing position. You make the rotation and alignment decisions based on what you see through the viewfinder. It provides protection to your lens front glass element. 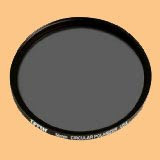 A polarizing filter is about the most expensive filter you can buy for your camera. I've seen a price range of $50 to $150 dollars. Ask any pro photographer and he/she is going to say, "It's worth the money." A polarizing filter is dense. By this I mean the filter is a dark gray color (see picture at top of this post). You lose about 1.5 to 2 f/stops of light when you use a polarizing filter. This is not generally a problem (especially if you use a tripod -- like I preach). But be aware that your aperture and shutter speed will be wider and slower (respectively). This is a problem in lower light conditions. Fortunately, this filter is generally used in bright sunny conditions where there is ample light. Many DSLR camera manufacturers offer polarizing filters for their family of lenses. Tiffen and Hoya are two filter manufacturers who also make a complete line of high quality photographic filters. Digital Imaging Note: Some might say, "Well I could do this in Photoshop." If you are an experienced Photoshop user, that might be true. However, it would require some sophisticated masking and saturation/density adjustments to replicate this filter effect. I would counter by saying, "Why not just do it at the time the picture was taken. No digital image enhancement required. You see what you're getting immediately. And it's easy. And if you don't do your own digital computer enhancement, it's a no-brainer. Buy the filter. I hope this helps you. You should be immediately rewarded with some exceptional outdoor/landscape shots. If you have any questions or comments, you know where to find me.